Many months after we started this blog, we finally braved the incredibly long 20 minute drive to each other’s house to bake together. We’ve both recently finished our undergrad degrees and tomorrow is our graduation. As always, baking is an appropriate way to mark this occasion. 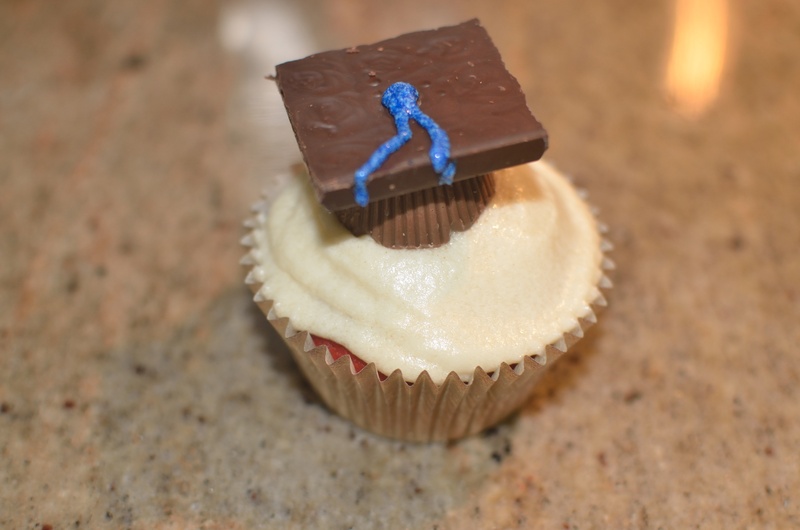 Red Velvet cupcakes are really popular right now (we’re still trying to figure out why), so we thought we would bake them and add a little graduation cap on top for some extra excitement! This recipe is from Paula Deen, and is different from the Red Velvet cake recipe that we posted a few weeks ago. The cupcake itself is less chocolatey, but extremely fluffy! 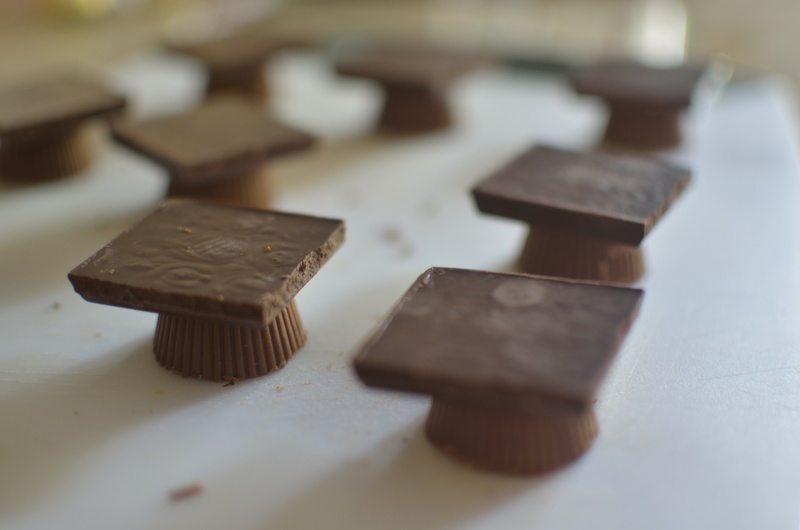 To make the graduation caps, we bought peanut butter cups for the base, and glued chocolate squares on top using Nutella. We then piped on frosting for the tassels. 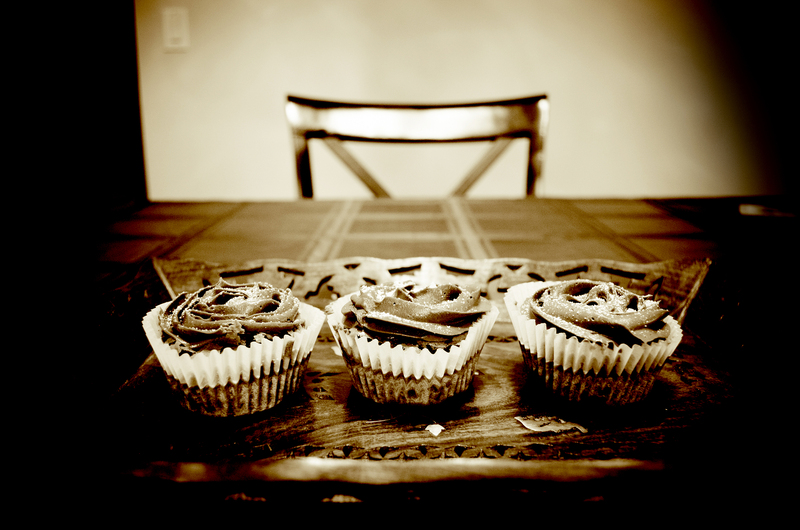 We thought we should experiment with the frosting and tried a vanilla frosting recipe from The Pioneer Woman. It tasted wonderful, but personally, we would not make it again, purely because of the runny texture. Thanks for celebrating with us, and see you soon! 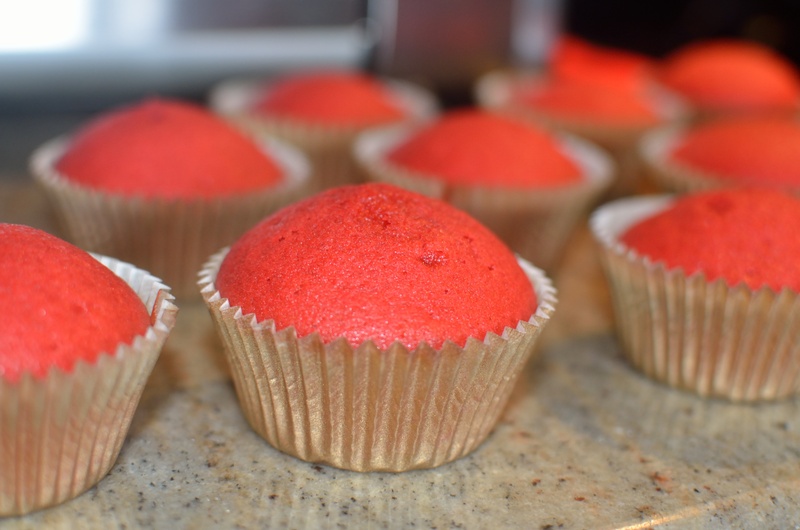 Cupcakes: Preheat the oven to 350 degrees F. Line (12-cup) muffin pan with cupcake papers. Bake your favorite chocolate cake and let it cool. In a small saucepan, whisk flour into milk and heat, stirring constantly, until it thickens. You want it to be very thick, thicker than cake mix, more like a brownie mix is. Remove from heat and let it cool to room temperature. (If I’m in a hurry, I place the saucepan over ice in the sink for about 10 minutes or so until the mixture cools.) It must be completely cool before you use it in the next step. Stir in vanilla. 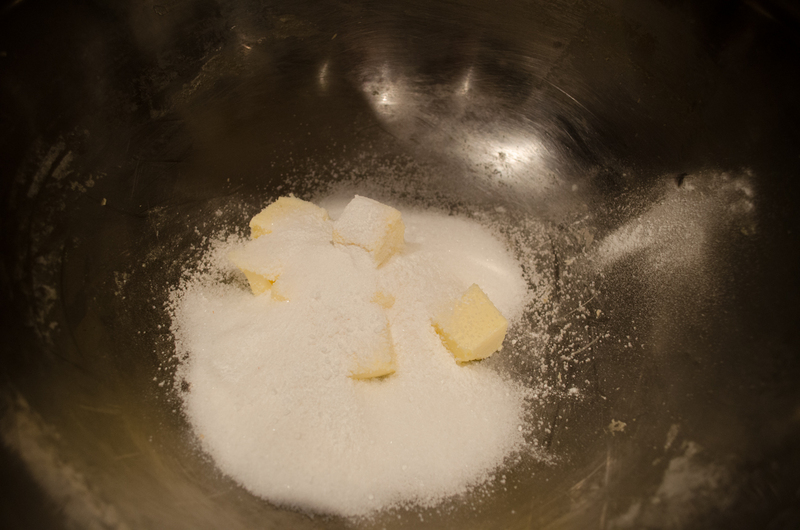 While the mixture is cooling, cream the butter and sugar together until light and fluffy. You don’t want any sugar graininess left. Then add the completely cooled milk/flour/vanilla mixture and beat the living daylights out of it. If it looks separated, you haven’t beaten it enough! Beat it until it all combines and resembles whipped cream. A lot of changes are going to be happening in the next few months. We are all growing up, and having to make something of our lives. This is freaking me out! I miss being a kid. Someone’s always there to take care of you, and there are no exams or interviews…what a magical time! 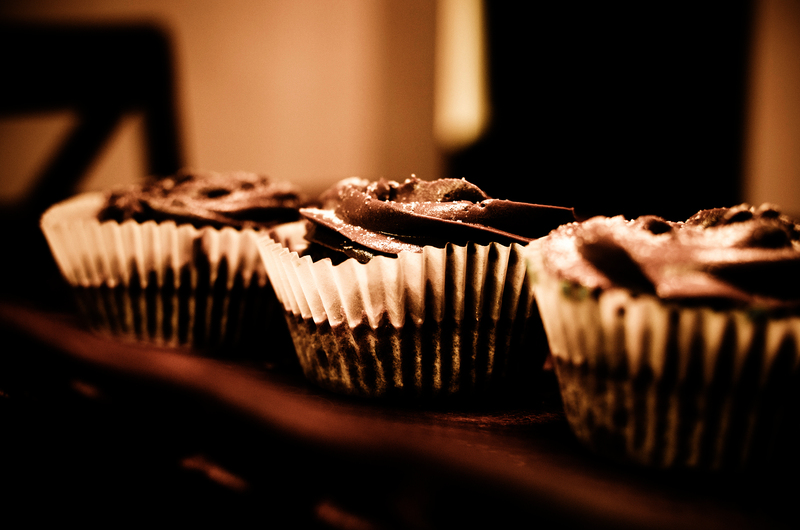 What better way to relive your childhood than through chocolate cupcakes?! I made these cupcakes for the birthday of a family friend’s son (with help from IS)! The chocolate cupcake recipe is from Ina Garten, and it’s very special to me because it was the first cake that I ever made. It is the easiest cake recipe to pull off, and it always turns out super moist and yummy! As always, I used the Fluffy Vanilla Buttercream recipe, for the frosting-why try something new when what you have is perfect, right? Here’s the link for the frosting: https://sweetlittlebrownies.wordpress.com/2012/10/29/me-love-coookies/. Also, the birthday boy requested “chocolate on the bottom, and vanilla on the top”, and I had to abide by his conditions! 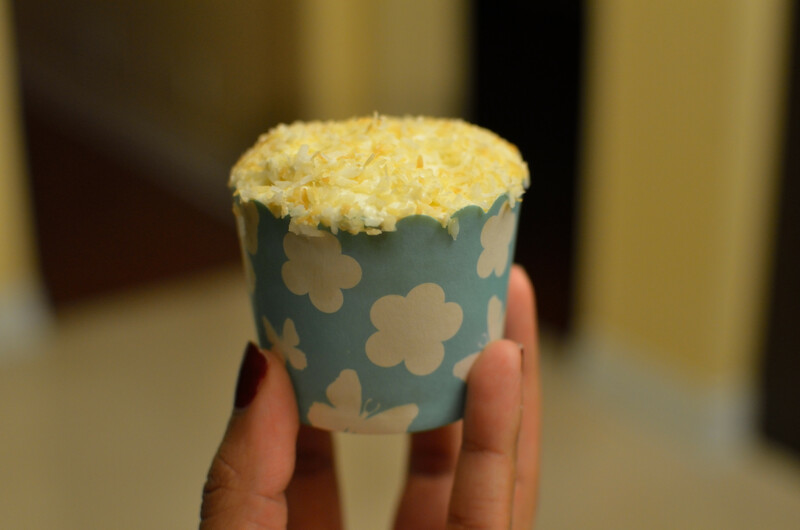 I wasn’t able to take any process pictures, but honestly this is the simplest cupcake recipe ever! You can mix everything up with a spoon-no need to pull out your electric mixer, for this one. The cupcakes were baked at 350 for about 15-20 minutes, and I put them in the fridge to cool completely before frosting them. 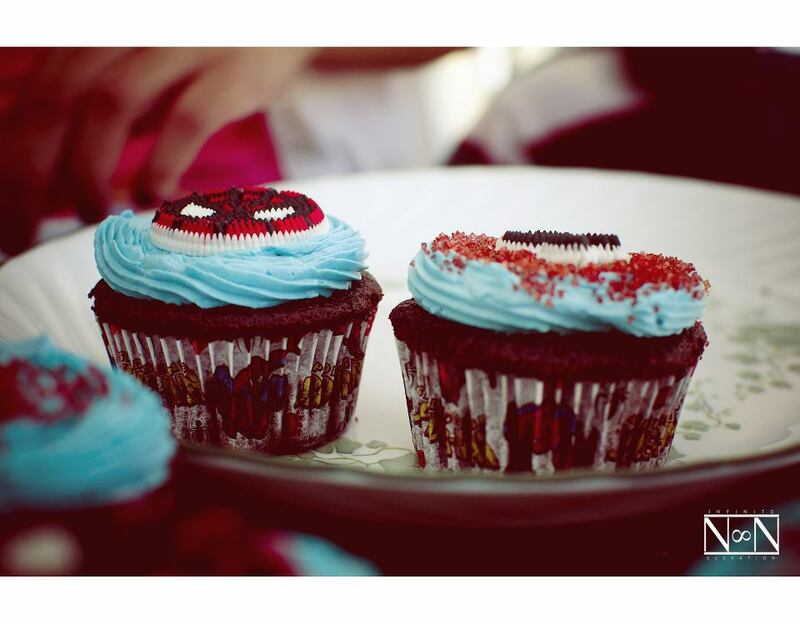 We made the frosting, and tinted it blue to match the Spiderman theme. Here I used the 6B tip, for the first time, to pipe on the buttercream, and it turned out beautifully, as you can see! 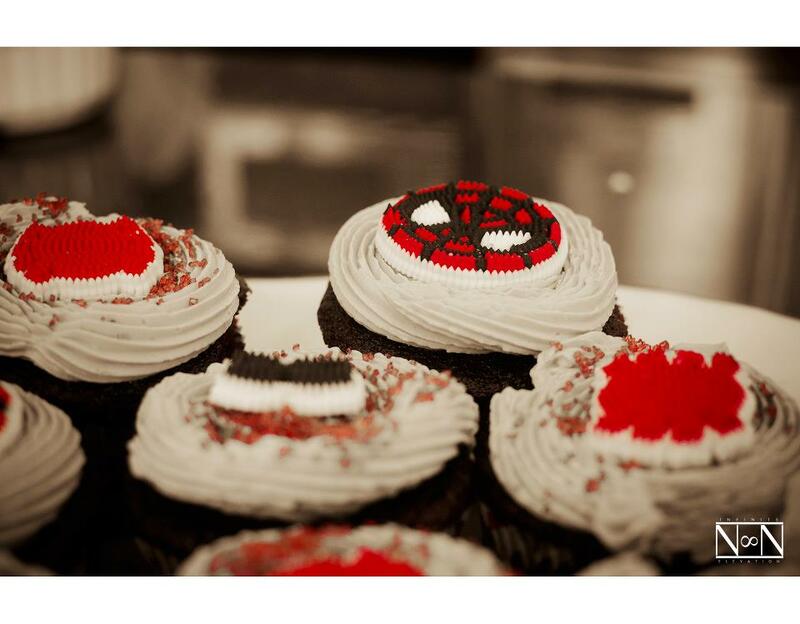 For the decorations, I had red sanding sugar, so we sprinkled some of that on each frosted cupcake, and then put on the Spiderman decorations. Ta da! 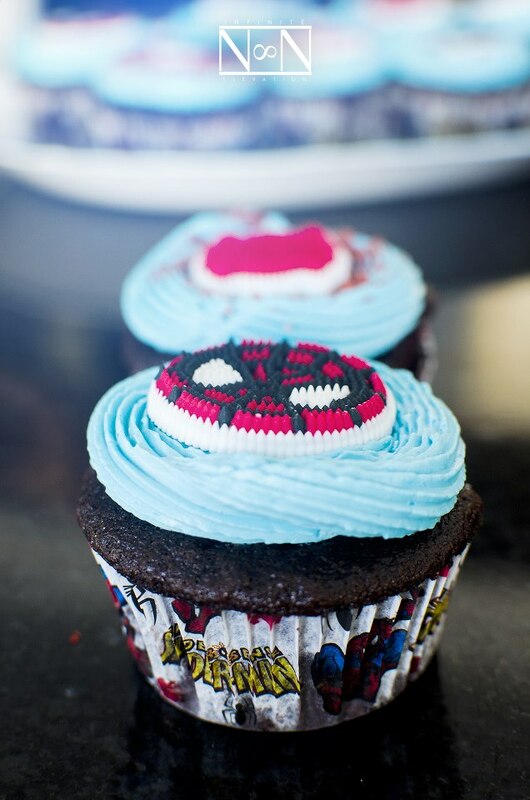 Impressive, yet simple cupcakes, perfect for a six year old! 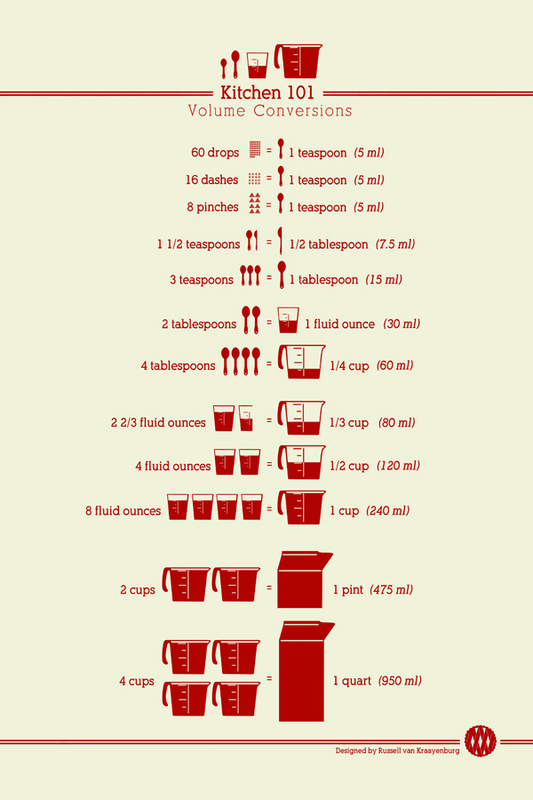 Also, a quick tip, I found this conversion chart on BuzzFeed yesterday, and it is definitely helpful to keep in mind when you’re baking! Thanks for coming by this week! Please feel free to follow us, by typing in your email address at the bottom left of the screen! Special thanks to V for the all of the beautiful pictures! Preheat the oven to 350 degrees F. Line cupcake pan with paper liners. Sift the flour, sugar, cocoa, baking soda, baking powder, and salt into the bowl of an electric mixer fitted with a paddle attachment and mix on low speed until combined. In another bowl, combine the buttermilk, oil, eggs, and vanilla. With the mixer on low speed, slowly add the wet ingredients to the dry. With mixer still on low, add the coffee and stir just to combine, scraping the bottom of the bowl with a rubber spatula. 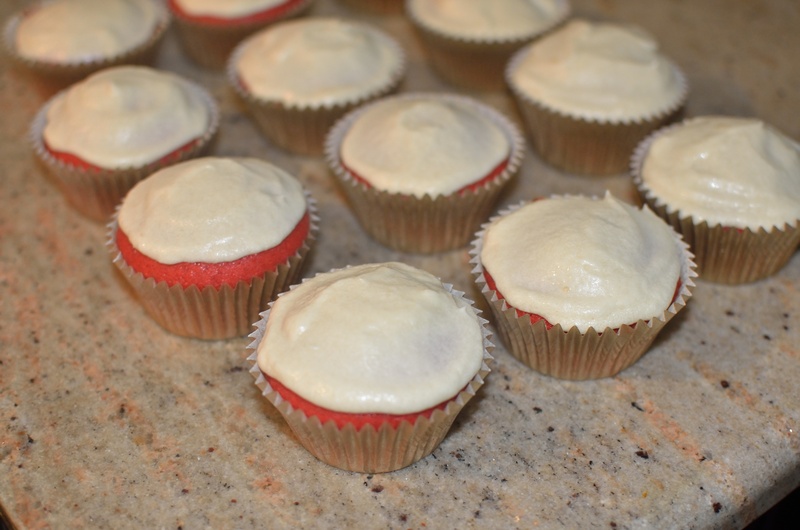 Pour the batter into the cupcake pan and bake for 15-20 minutes, until a cake tester comes out clean. Cool in the pans for 30 minutes, then turn them out onto a cooling rack and cool completely (in the freezer). I’m really bad with goodbyes. Like realllyyyyy bad! When I found out that one of my favourite people at my lab, D, was leaving, the best solution I could come up with was to bribe her to stay with cupcakes. 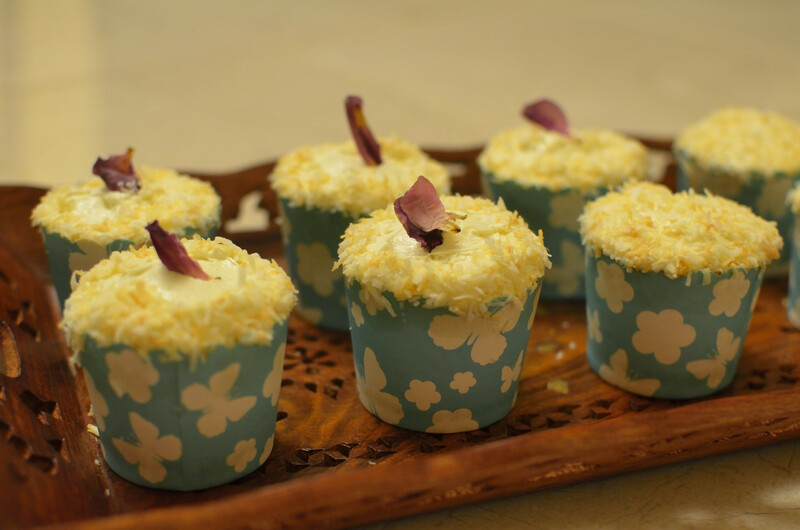 We went to a Thai restaurant last week, and D loved the coconut ice cream there, so I was inspired to make Mini Coconut Cupcakes with classic Buttercream. The cupcake recipe was modified from Cooking Classy (who adapted a Martha Stewart recipe), and the frosting from Baker’s Royale. I was originally going to do a coconut frosting, but thought maybe that was a little overkill! Let’s have a serious discussion about these cupcakes. They are AMAZING! 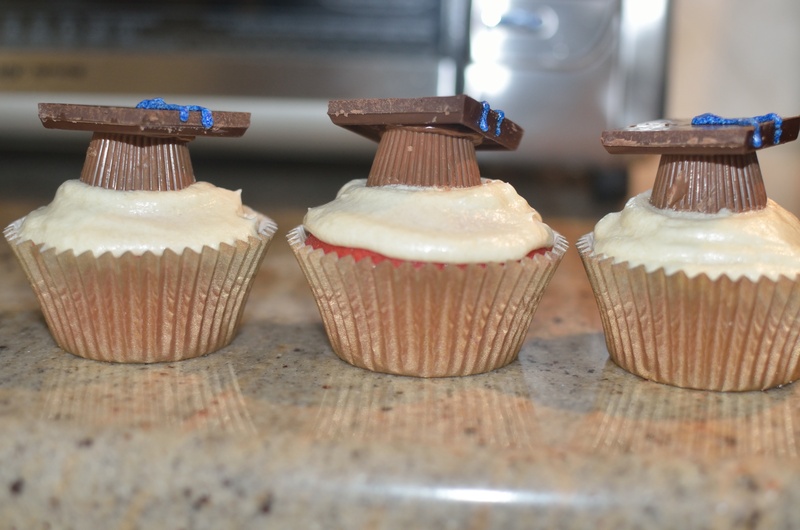 Possibly, the best cupcakes I have ever made. I’m almost 100% sure that it’s the coconut milk in the recipe that makes them so fabulous. They’re just so fluffy, and have a beautiful deep flavour to them! I don’t have any process pictures today, as things were a little hectic, but of course, I’ve included the recipe below, with my slight modifications. Now, for the most important part: making them pretty! I mean, they’re fantastic all on their own, especially with these pretty wrappers that S got me. BUT, of course, I like things extra pretty! I was originally going to pipe on the frosting in a rose shape, but sadly, I didn’t have any pastry bags at home, and I was forced to spread it on instead. 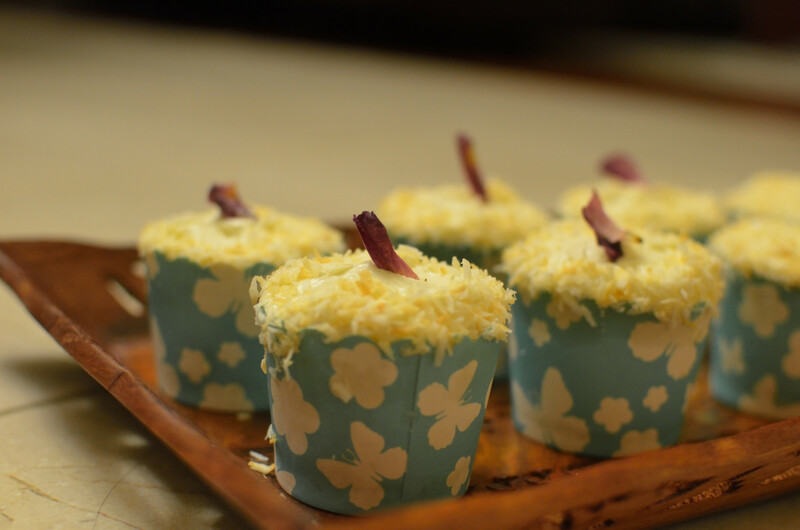 I then dipped the edges of the frosted cupcakes into toasted coconut flakes and placed a rose petal on some of them, just for some extra appeal! Here they are, in all of their glory! Come back next week for another sweet treat! In a mixing bowl, whisk together flour, baking powder, salt and coconut, set aside. With an electric hand mixer on medium high speed, cream together butter and sugar until light and fluffy about 3 – 4 minutes. 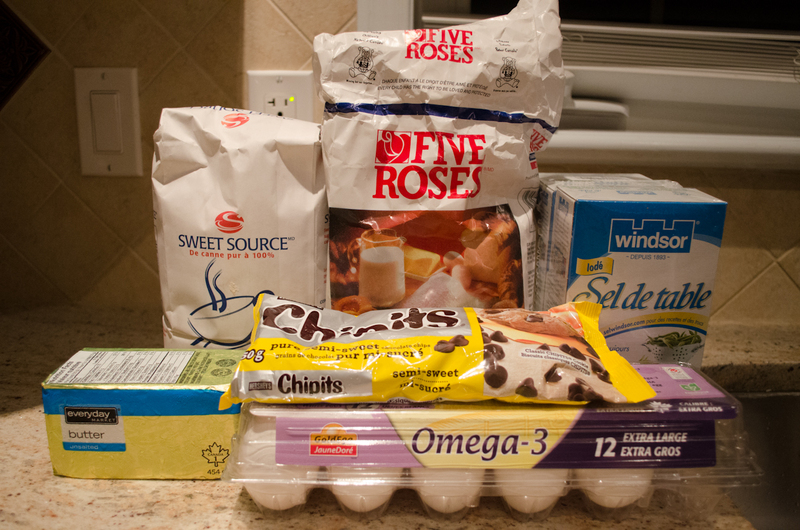 Add in eggs and egg whites, mixing after each addition. Stir in vanilla. With a wooden spoon, add in flour mixture alternating with coconut milk in three separate batches, mixing gently until combine after each addition. 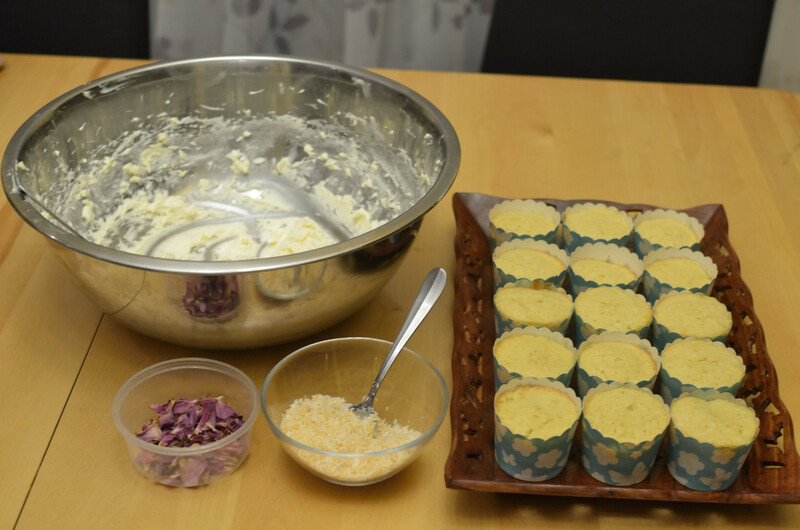 Divide batter evenly among 24 paper lined muffin cups, filling each cup about 2/3 full. 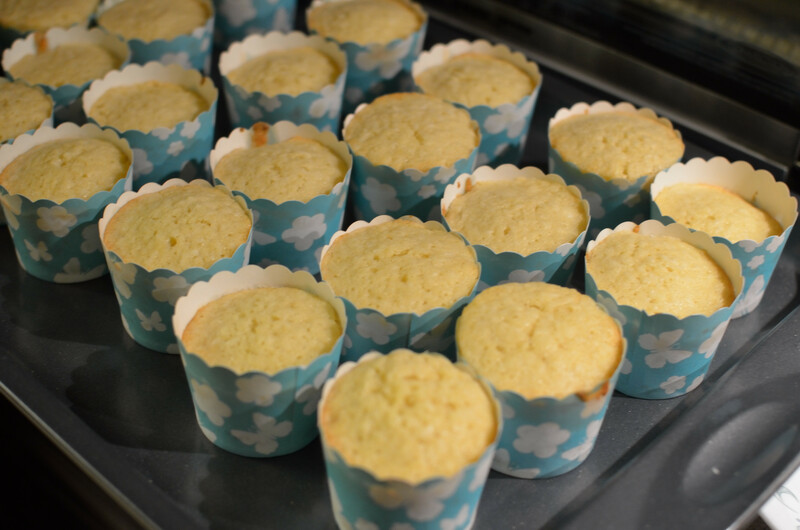 Bake in preheated oven, rotating muffin tins once halfway through baking, until toothpick inserted in center comes out clean about 17 – 20 minutes. Place in freezer to cool quickly. 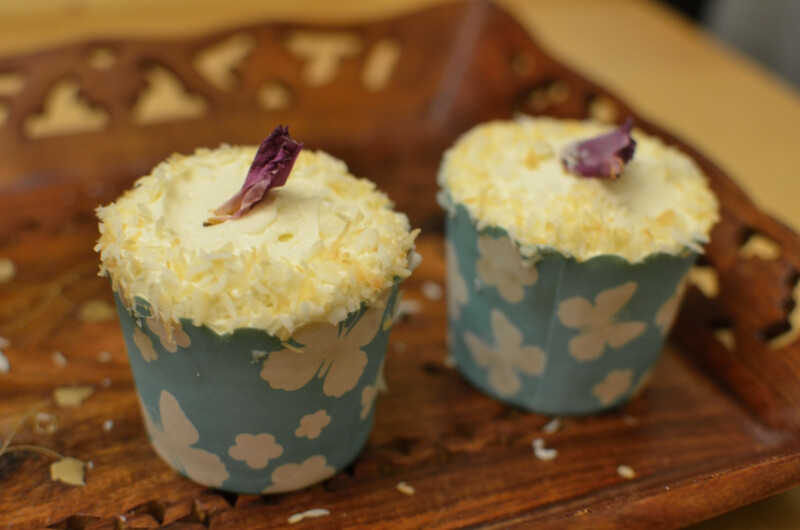 Frost with Buttercream Frosting and garnish with additional shredded coconut if desired. Store cupcakes in an airtight container, in the fridge. This week has been super busy for both of us, so I have a short and sweet recipe for you today. Our blog is called “Sweet Little Brownies”, so obviously we NEED to have an awesome brownie recipe! I promise, this is the first of many brownies! Since I love cupcakes so much, I thought why not merge to two and make a brownie-cupcake chimera (ooo fancy science word lol)! I personally love fudgy super intensely chocolatey brownies, but I know many of you are dark chocolate haters, so this one is cakey and sweet and just plain scrumptious. Anyone see last week’s episode?!?! Anywho, I got this recipe from joyofbaking.com, which is a great resource, and has lots of fool-proof treats. We only use omega 3 eggs here at SLB-our treats are good for your brain AND your heart! For the cupcakes, first melt the semisweet chocolate and butter over a double boiler. Then once it is cooled slightly, add sugar, and vanilla, and 3 eggs (one at a time). Once that’s blended really well, add flour and salt. Pour that into your muffin pan, and bake at 325 degrees Celsius for 20-25 mins. To make the frosting, melt more chocolate (really good for you, trust me ;P), and once it has cooled, add butter, and then sugar and vanilla. I used less sugar because I found they didn’t need as much, but of course, it’s really upto you. I used the Wilton 1M tip for the frosting, but you can even skip the frosting, and eat them plain, maybe with some powdered sugar sprinkled on top? Scroll down for the full recipe. Thanks again to V for the awesome artsy photos! Thanks for visiting us! See you next week, for some fab treats by S! 1. Preheat oven to 325 C, and line muffin tin with wrappers. Adjust your oven racks so the rack is in the middle. 2. Melt chocolate and butter over double boiler. Once smooth, remove from heat and cool for a few mintues. 3. Stir in sugar, vanilla, eggs, one at a time, until smooth. 4. Add flour and salt, mix well. 5. Divide batter into cupcake tin, and bake for 20-25 minutes. You want moist crumbs to stick to the toothpick when you check. If the toothpick comes out clean, then the brownies will be dry. 1. Melt chocolate in double boiler, remove from heat and cool to room temperature. 2. With a hand mixer, break butter until creamy, and add sugar then beat for 2 minutes. Add vanilla, continue beating. 3. Add chocolate and beat on low speed until thoroughly combined. Increase the speed and whip up the frosting until it is smooth and glossy. 4. Once brownie cupcakes are cooled completely (feel free to throw them into the freezer to speed up the process), frost them. Dust with icing sugar, if you like! Hi everyone! I hope you all loved last week’s lemon bars, clearly the two of us at Sweet Little Brownies love lemony things, but this week I decided to switch things up a little. 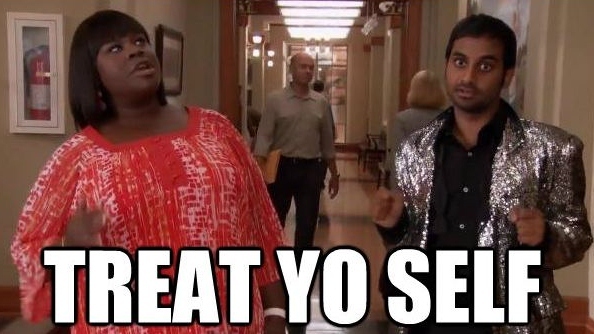 According to the magical World Wide Web, October is Cookie Month! How has this not been declared an international holiday?! Cookies always remind me of Cookie Monster and so to commemorate this important occasion, I decided to make Cookie Monster cupcakes. In case you guys are bored with life and need something to make you laugh, check out this hilarious song by Cookie Monster: http://www.youtube.com/watch?v=-qTIGg3I5y8. I was inspired by this lol. For these cupcakes, I used our favourite Meringue Buttercream from the first post, and made funfetti cupcakes. Funfetti cupcakes are the best! I also made mini milk chocolate chip cookies for Cookie Monster. I made them for a little get together, and everyone seemed to love them-you should make them too! I didn’t take a lot of process pictures this time, since I was in a rush, but I didn’t use any of my mad Iron Chef skills to make these cupcakes, so you should be good to go! For the cupcakes, first cream the butter and sugar. Then add the dry ingredients, milk, and SPRINKLES! Did I mention I love sprinkles? Make the Meringue butter cream frosting, and dye it blue. I used Wilton Gel food colouring in Royal Blue. 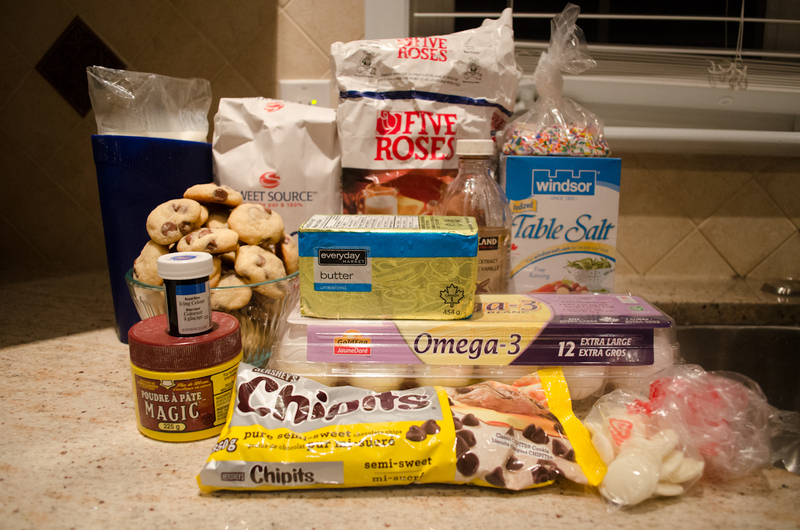 To make Cookie Monster’s eyes, I bought white chocolate wafers and semisweet chocolate chips. To glue them together, I just held the flat end of the chocolate chip against a hot surface and then placed it on the white chocolate wafer. 1. 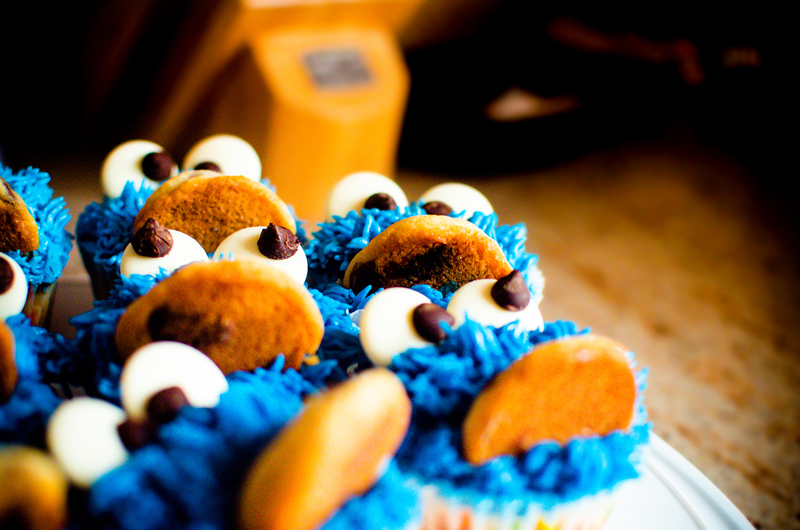 Cut a diagonal slit in the cupcake for Cookie Monster’s mouth. 2. Spread a thin layer of blue buttercream onto each of the cupcakes, it doesn’t have to be pretty, so feel free to just use a butterknife. 3. Use a Wilton #233 tip to get the fur effect, and pipe on the frosting to cover the whole surface. 4. 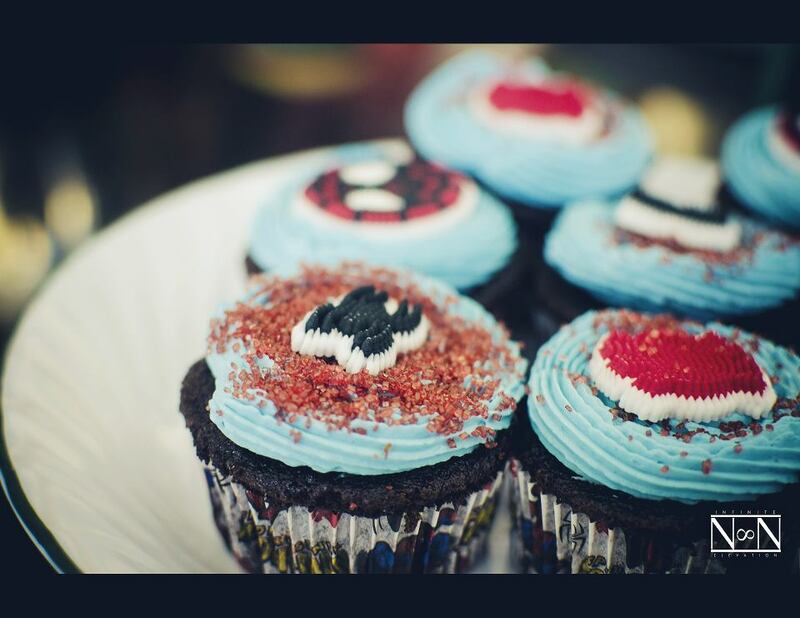 Gently place the two “eyes” onto the cupcake so they are standing up, and pointing in different directions. 5. Cut the cookies in half, and shove one half into his mouth. Don’t they look awesome?! Special thanks to my brother V for all of the amazing pictures! As always, the recipes are below. Thanks for checking us out this week, and remember to come back next Sunday for a new sweet little treat! 1. Preheat oven to 375 degrees Celsius and link a baking sheet with parchment paper. 2. In a medium bowl, combine flour, baking soda, and salt. 3. In a large bowl, beat butter, sugars, and vanilla until creamy. Add egg, beat well. 4. Beat in flour mixture, and stir in the chocolate chips. 5. Drop dough by rounded teaspoon onto the parchment lined cookie sheet, leaving about 4 cm between each cookie. 6. Bake for 9-11 minutes (usually I bake them for 9 minutes, exactly). 2. Cream butter and sugar until fluffy and add vanilla. Beat until combined. 3. Combine all of the dry ingredients in another bowl. 4. Add half of the dry ingredients to the wet ingredients. Mix to combine. 5. Add milk, mix to combine, and then add remaining dry ingredients. 6. Fold the sprinkles in gently. 7. Pour into cupcake pan, and bake for 18-20 minutes, until toothpick comes out clean. 8. Cool, and then frost. 1) Combine egg whites and sugar in a bowl placed over simmering water. Bring mixture to 150 degrees F while whisking constantly. 2) Transfer mixture to stand mixer bowl, fitted with a whisk attachment and beat on medium speed until mixture cools and doubles in volume. 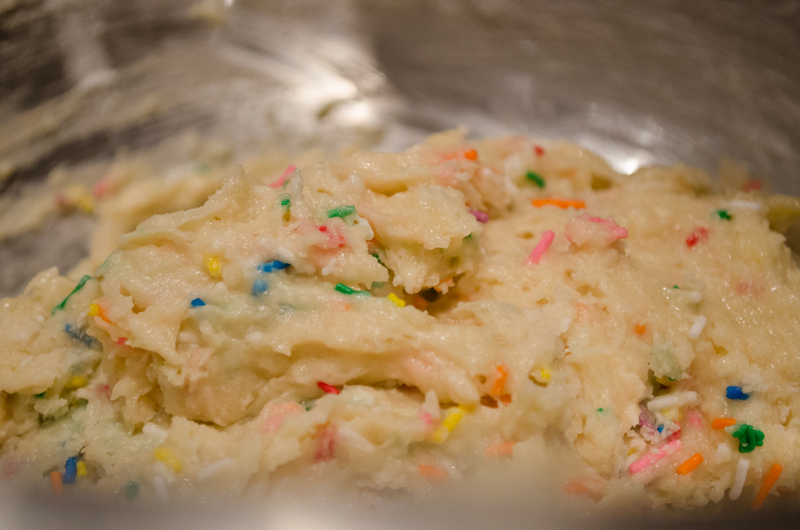 3) Add butter one piece at a time, mixing to incorporate after each addition. Add salt and vanilla and mix to combine. The frosting may appear to look separated, keep mixing and it will come together (this commonly happens when making Swiss Meringue Buttercream). 4. 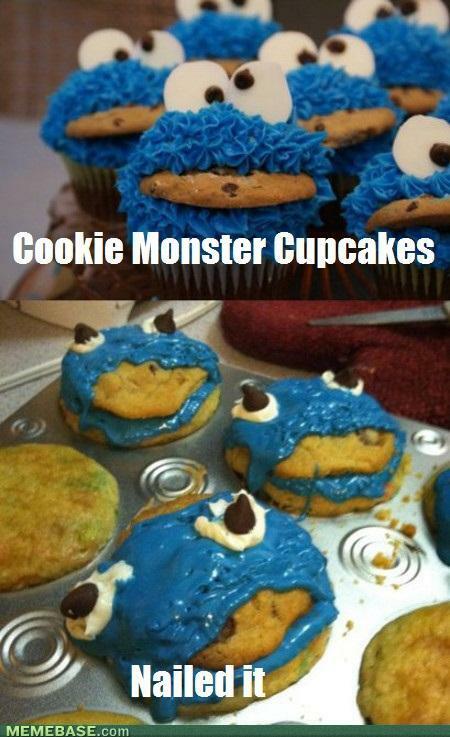 Colour the frosting until it turns into the perfect Cookie Monster blue.